Hi! My name is Bowser. I am a happy go-lucky kind of guy. I was found as a lost pug in a small town in Nebraska several years ago and my family was contacted and asked if they would take me since they already had a pug. So, I went to live with my pug sister, Bo Bo and a family that loved me very much. However, they had a new baby and the baby was allergic to me and Bo Bo. They kept us for as long as they could but since we had to be separated from the baby they didn’t feel like we were able to be part of the family and they thought it was only fair to us that we move to a new home where we can be part of the family again. We have brought so much joy and laughter to our foster family, they think we are awesome. I love Bo Bo and would love to be adopted with her but I think I would adjust okay if that didn’t work out. I do enjoy being around other dogs and quite honestly, Bo Bo and I are so nutty together, I have no idea why you wouldn’t want to keep us together! Our favorite game is tug-a-war and we play this for an hour or so sometimes before we tire of it. But heck, let’s talk about ME! I am somewhere around 6 years old and I’m in very good health. I am house trained and although my first family said I would mark occasionally, I have not done this at all at my foster home. 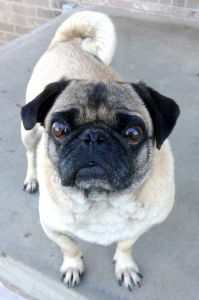 I have plenty of energy and love to play with soft toys but I also enjoy time on the sofa with my people or other pugs. I am very well behaved and walk on a leash very well. I have a fenced in yard now but I didn’t at my first home and I stick around very well. The other pugs and I love to walk down the road to the mailbox and we stick together and close to our people. I am the first one to the gate to greet whoever comes home and I wag my entire back end when I see you! I really love life and it is apparent that I have been raised by people who loved me. My foster Mom says I’m part cat because I love to sit on the back of the sofa. The cat that lives here didn’t know what to think about that when I first came here because that is also where she lays but we have worked that out and I have my end of the sofa and she has hers and we share it just fine. I love all people, dogs, cats and probably any other kind of animal I come across. I am crate trained and will run right to my crate if you say, “go to bed”. I prefer to sleep in the big bed with my people and the other pugs but I’m also happy in my crate. If you are undecided on what color or gender of pug you want, Bo Bo and I are just your ticket! One of us is fawn (ME) the other black. One is male (ME) and Bo Bo is a female. We are both nutty pugs but I am more laid back than Bo Bo. Together we are a hoot and we will keep you entertained for hours. When we are not entertaining you, we will entertain each other! However it works out, we are looking forward to finding our furever home(s). Interested in adopting? Bowser’s minimum adoption donation is $325.